On Tuesday, my husband Douglas and I were walking Caramel in the park. I was talking excitedly about the different things I had been doing for the first two days of spring break. This year was different. Implementing the School Year Challenge in September 2017 has forced me to manage my time differently in relation to balancing the time I spend on work-related tasks and home projects. As a result, I am not as stressed out as I have been in the past and didn’t need a decompression period. I started spring break 2018 with energy and hope for all I would iccomplish* during the week off. Back to the walk…as I was talking to Douglas about what I had been doing, he asked me how March’s project(s) were coming. The conversation moved from what I had iccomplished* to what I still wanted to do. 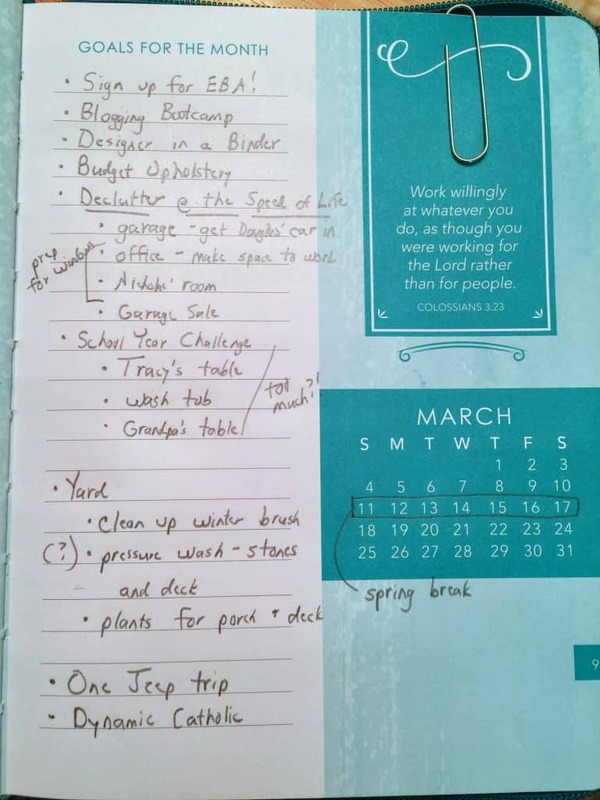 My list was long and there were even more things on it than when I brainstormed a list at the beginning of the month. Silence descended over my animated talking and I could feel my energy become negative. I was going into my head and stressing myself out. My chest became tight with self-imposed expectations that I knew would be impossible to fulfill. Even though I knew I was causing the change in conversation, energy, and my stress level, I couldn’t pull myself out of it. Our walk finished in silence and when we got home Douglas offered to wash my Jeep, one of the new tasks I had added to my to-do list. I responded with a curt, “Sure,” and he went to take care of it. “Sheesh, what is wrong with me?” I asked myself as I moved things around in the garage to get out the wash tub and enamel topped table (two of March’s possible projects). I thought I had been making progress on not stressing myself out but had quickly spiraled into sullen silence which had been my usual MO in the past. This was NOT a feeling I liked. After much discussion with myself in my head, I realized I was not looking forward to doing March’s projects. Why not? I had been so excited when I picked them out at the beginning of the month. 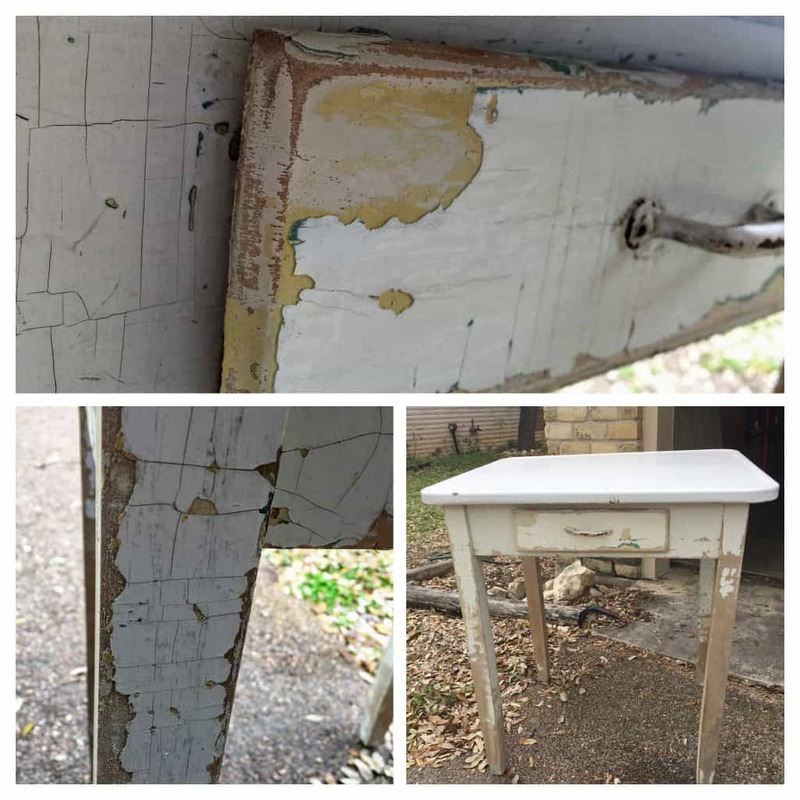 After I pulled the wash tub and enamel topped table to the driveway, I grabbed a scraper and sanding sponge to see how much more of the paint would come off of the table legs. Quickly, I became frustrated because while it looked like the paint should flake off, it wasn’t. My attention turned toward the wash tub. This was supposed to be the easy project…just sand the rust spots and spray with a clear protective coat. After sanding a couple rust spots, close inspection of the tub made me identify the gray on the surface was NOT metal, but paint that was a metal color! I could see the paint had started flaking off in places so I used the sanding block to see how easily it would come off. The paint sanded off easily, but immediately I was engulfed in a fine cloud of paint particles! I held my breath and quickly stepped back from the cloud. 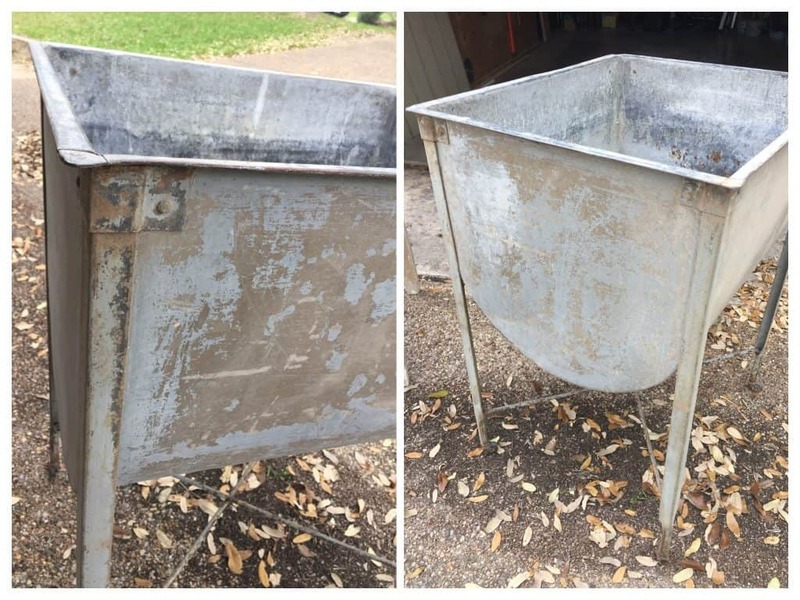 What kind of paint was used on the wash tub? Are the dust particles dangerous? How am I going to get the paint off the table legs? Why isn’t anything every easy? Maybe using paint stripper is the answer. If I use paint stripper, how do I dispose of the rags, brushes, and stripped paint? I still have the rags from February’s staining project that I don’t know how to get rid of! Chemical strippers freak me out…all those warnings! What is the risk to myself and the environment? THIS WAS IT…why I wasn’t excited about doing March’s project(s): I had too many questions and not enough answers! Watching videos and reading online about how other people have successfully transformed items through painting and staining made it look easy. But it wasn’t easy for me because almost every step I took in the process led to questions I couldn’t answer. Self-reflection allowed me to recognize the negative energy and self-imposed stress generated on the walk came from the fact that it makes me uncomfortable that what seems easy for others was not easy for me. For so long I have been in the role of teacher and honed my craft so I was the best educator I could be. Now I find myself in the role of student. Starting, for the most part, at the beginning of learning a new skill. Jumping in, trial and error, winging it, making it up as you go…those are strategies that go against my nature. The questions I have need to be answered in order for me to move forward. 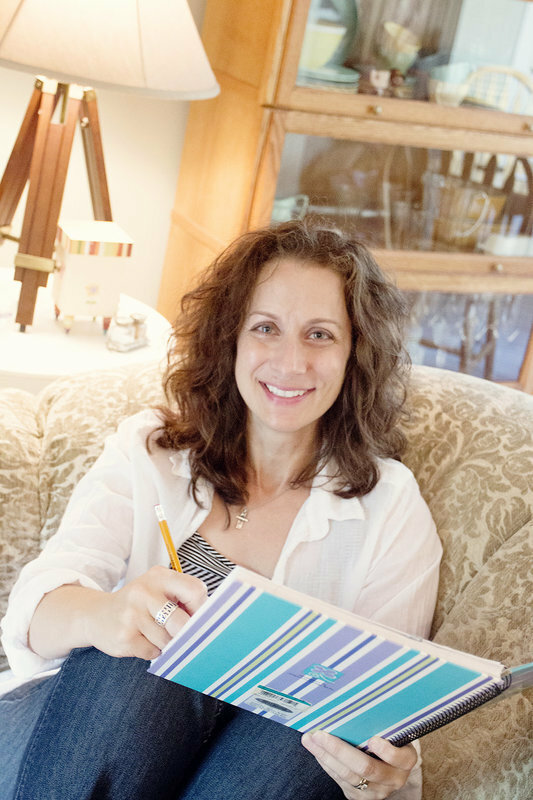 Have I really taken two steps back on my journey of turning thinking into doing? No, I don’t believe so. Sure, the walk/talk with Douglas produced negative energy and stress-related feelings I thought I had conquered. But, the honest conversation with myself resulted in an acknowledgement of feelings and why I was having them. Accepting my role as student/learner provides a framework that is right for me to make positive changes in my life and home. What I do I need to do now? I will get my questions answered and begin the process of building a foundation of knowledge for a new skill set!